This week, I want to address legislation regarding Trade Promotion Authority or “Fast Track”. This legislation will hold the Obama Administration accountable and ensure transparency for the American people when the government negotiates trade agreements. I share your concerns regarding this Administration, or future administrations, unilaterally negotiating secret trade deals. That is why I supported this legislation that gives Congress not only the final say on trade agreements, but also allows Congress the ability to set minimum standards for negotiating these agreements. Trade Promotion Authority establishes over 150 baseline conditions that the President must meet when negotiating trade agreements. These requirements are intended to protect American jobs by stopping foreign nations from cutting their business costs unethically, which often undercuts American workers and businesses. With 95% of the world’s population living outside of America’s border, we must ensure the American worker has access to foreign markets on a level playing field. In order to create more opportunity and more high-paying jobs here at home, we need to sell more American-made products and services overseas. Trade Promotion Authority helps make that happen. If a trade agreement is not a good deal for the American people, I will not support it. For more information on my position on trade, please click here. Tom writes: “If a trade agreement is not a good deal for the American people, I will not support it,” yet he seems to have already concluded that it is a good deal even though the details are as yet not known. I hope he is right. 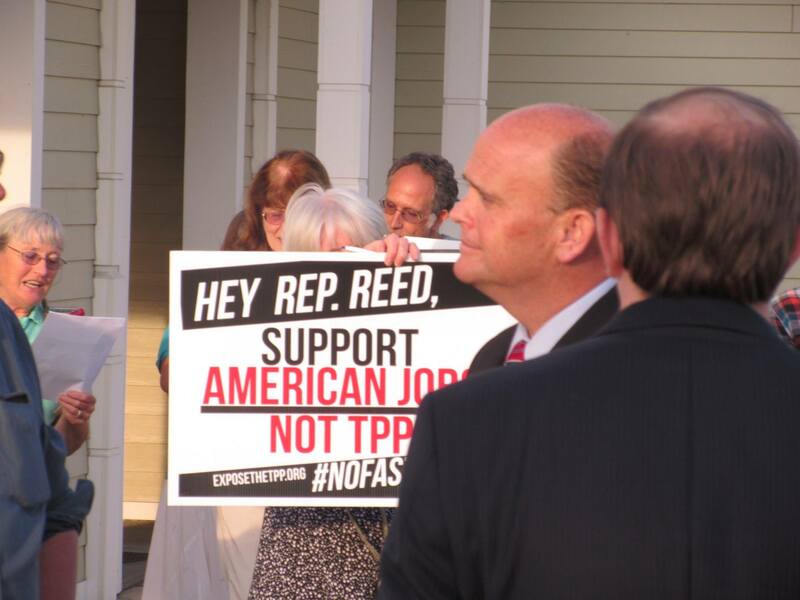 This entry was posted in Congress, Political, Reed's Views and tagged Fast Track, TPA, TPP, trade. Bookmark the permalink. I wonder what is his definition of “a good deal”. His mind was made up for him by the corporate interests that would keep him in office. Closed minds rarely change their opinions because of facts. What products is he talking about? Most manufacturing is now done outside the US, where labor is cheap. Companies like Corning, Inc. sell products overseas and want their patents respected even if the actual manufacturing is done elsewhere–our post industrial economy. Tom often uses the wrong word– here “unilaterally.” It isn’t easy to negotiate unilaterally; I think he means “independently of Congress,” even though with Fast Track Congress delegates that responsibility to the President. Whatever Tom Reed says, this cannot be a good deal for the American worker if so many Republicans (like Tom) are for it.